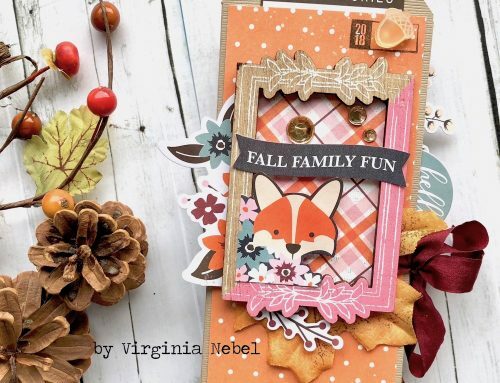 Oh What Fun with Virginia Nebel! November greetings! 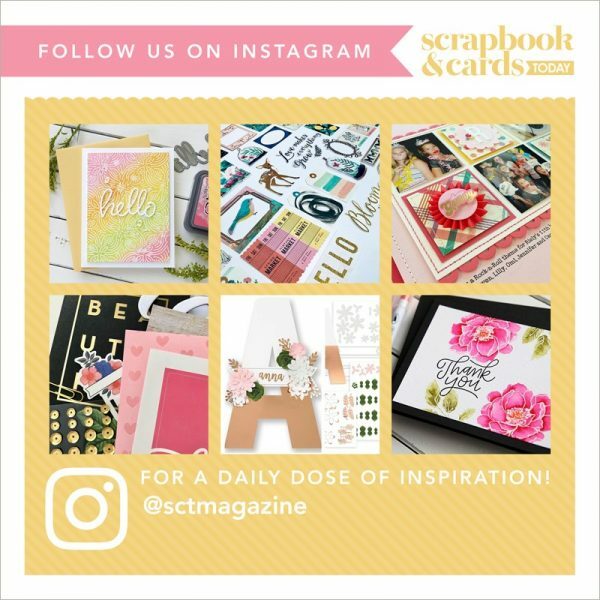 With a definite chill in the air lately I can’t think of a better time than now to cozy up in my scrap space! Have you started or are thinking of creating a December album? 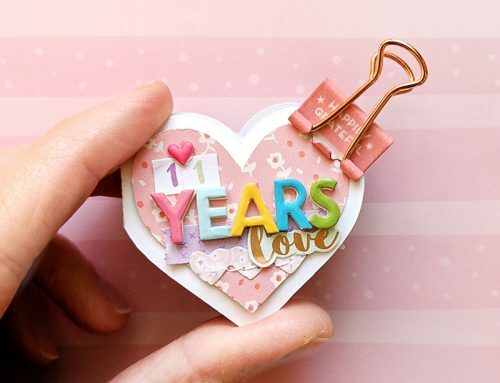 It is a lot of fun to put together and would make a wonderful keepsake or gift for someone very special. 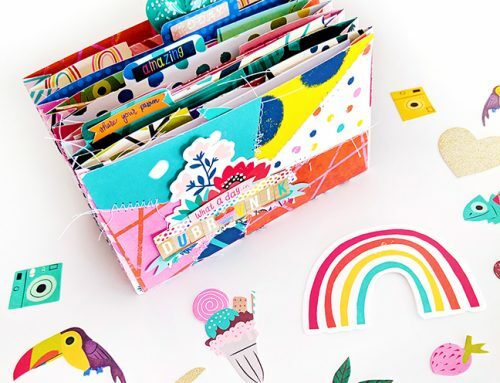 Whether you are shopping for new products or from your stash, just gather up supplies that make you happy, it will all work- trust me! 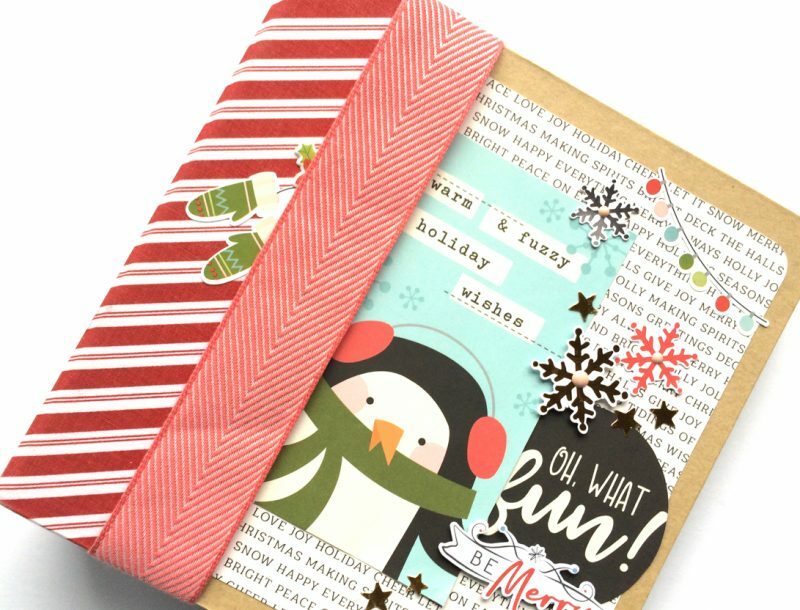 Let’s take a peek inside my December album using some fabulous wood veneer letters from Crate Paper’s Fa la la collection, they are delicate wood letters dipped in white paint (makes me think of pretzels dipped in white chocolate, yum!). 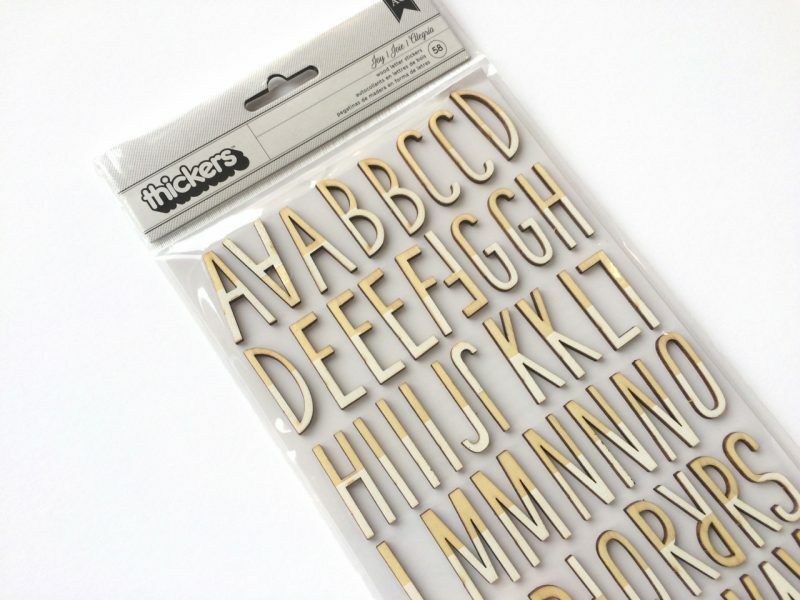 This package contains 58 letters and I wanted to make the most use out of this set and I was able to come up with 10 Holiday words. It was a funny scene at my desk, I was playing Wheel of Fortune taking a consonant here and there and mixing in some vowels to solve the puzzle! The 10 words are: FUN, LAUGH, BRR, SNOW, WISH, FAMILY, COZY, SMILE, EAT and WONDER (the ‘W’ was created by joining two ‘V’s). 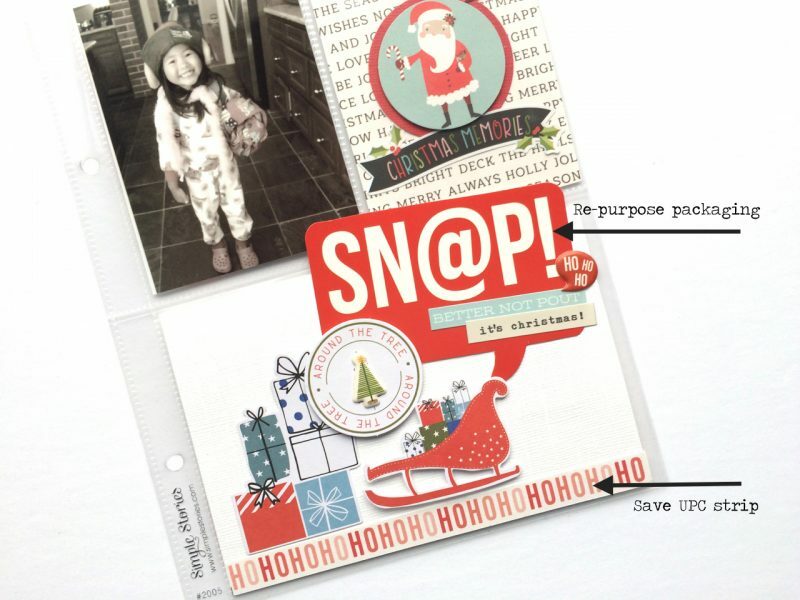 I used the Simple Stories Sn@p Holiday album for my album and here on this pocket card I re-purposed the ‘Sn@p’ bubble from the packaging. 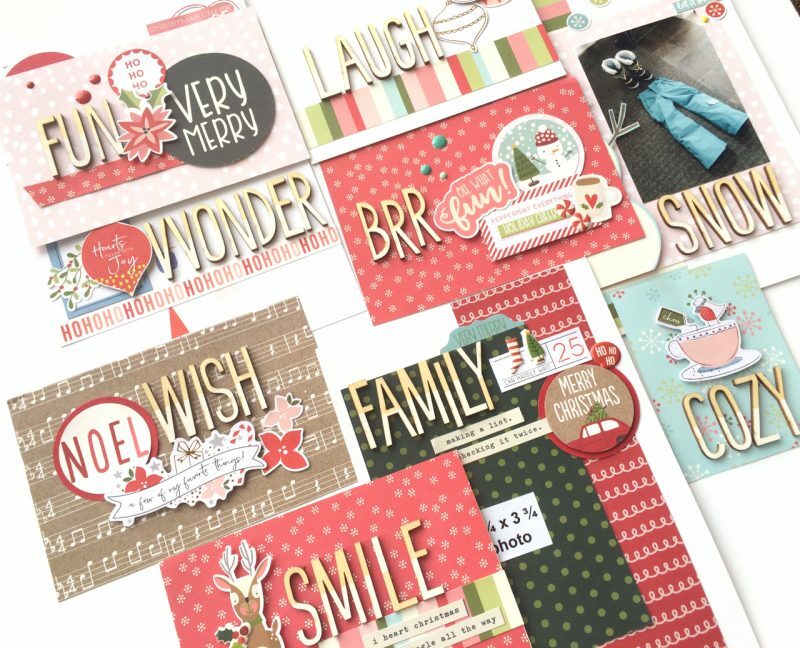 Also, by saving the UPC strips from the pattern papers, you can use them as border strips for your cards. 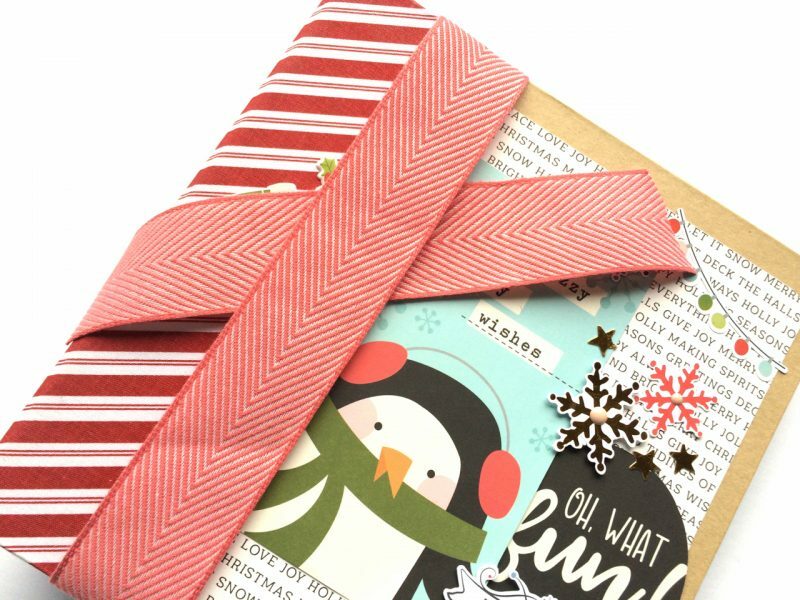 Lastly, a pretty ribbon always adds a nice finishing touch. I like to fake tie my pretty bows, just wrap ribbon around the book first and then use a separate smaller piece and tie a simple knot onto it, voila a perfectly tied bow! We have a few of Virginia’s Oh What Fun kit available in the office. Cost is $50 US or $55 Cdn plus $12 shipping. 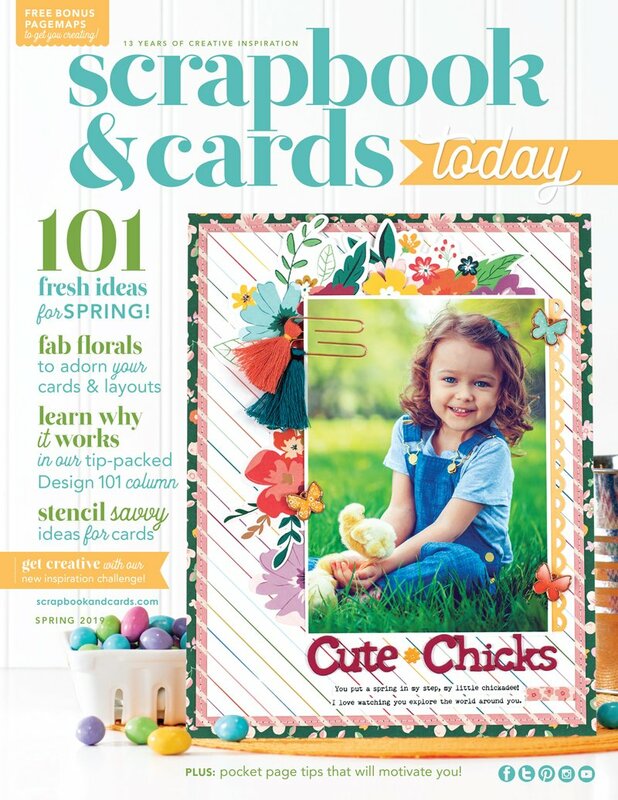 If you are interested in one of these beautiful kits, be sure to send an email to ideas@scrapbookandcards.com. Designer Monday with Paige Evans! 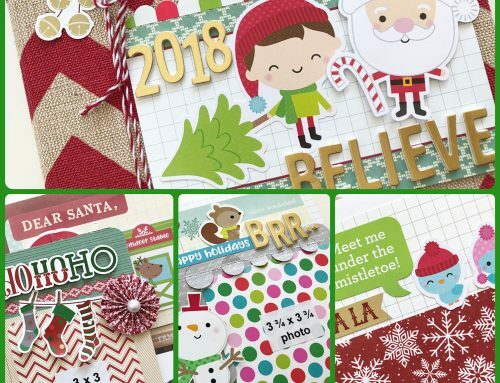 Our annual “Believe” holiday album is here! A new mini album from Paige Evans! 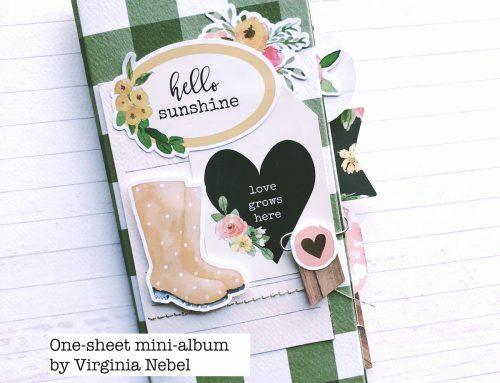 A one sheet mini album with Virginia Nebel! Love, love, love this album!!! I have it ready for pictures!! These are adorable! Love that little penguin! I’ve completed this album as a gift for my son and his family! Beautiful work Virginia! That penguin is irresistibly cute ! I agree, that penquin is adorable! Such a sweet mini album, love it. Can’t say enough how much I *LOVE* this kit, Virginia!!! Thank goodness I was one of the lucky ones that got my hands on it 😀 I can’t wait to use it to document my December.